Spend the upcoming weekend in San Diego enjoying everything California’s Beach City has to offer including Padres’ Baseball, Easter, and these top things to do. 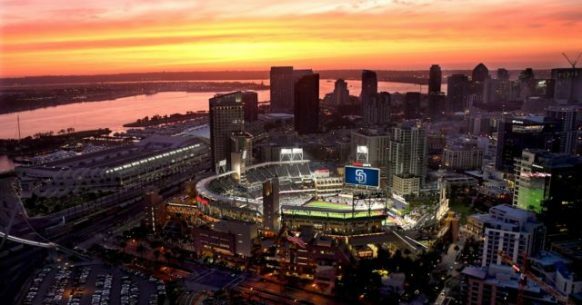 Catch the San Diego Padres take on the Milwaukee Brewers at Petco Park’s Home Opener! Game Day promotions and events include: Thursday – Opening Day Hat, Friday – Party in the Park: Winefest, Saturday – Fleece Blanket. The free, family-friendly 8th Annual East Village Opening Day Block Party will be the ultimate tailgating scene on J Street between 6th and 10th Avenues. Show your team pride and “root, root, root for the home team” as we kick-off the party with fun family games, activities, and much more! Enjoy great food, craft beer, and cocktails from delicious local restaurants. There will be a bike valet at the Block Party. Hop on down for an amazing Easter Weekend in San Diego including egg hunts on the beach, brunches, and train rides with the Easter Bunny himself. Beer: Included. Food: Included. Spirits: Included. That’s right, FOOD. You don’t pay for food at MVCBF. It’s a festival. You cannot be festive if you’re not feasting, and let me tell you what, we’re getting damn festive. Uncorked Wine Festivals is coming back to San Diego for the third annual Uncorked: SD Wine Fest at scenic Marina Park North on Saturday March 31st. This event features over 60 wineries, more than 200 wines from around the globe, champagne bar, amazing local ciders, gourmet food trucks, lawn games, live dj and a fun atmosphere to sip and savor with friends. Spending her days caring for her ailing mother, Lucha yearns to break her monotonous routine. Here’s a wild idea: an all-girl mariachi band! But it’s the 1970s, and girls can’t be mariachis…or can they? As Lucha and her spunky cousin hunt for bandmates, dodge disapproving relatives, and bring Mom along for the ride, they wonder: will the band come together? American Mariachi is a heartwarming and hilarious world premiere comedy about family, progress, and the freedom to dream big that will send your heart soaring and put a bounce in your step with a wave of vibrant, infectious live music.